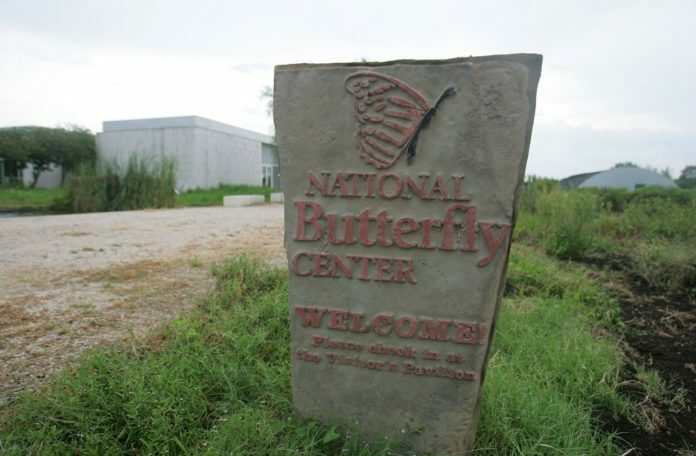 MISSION — Attorneys for the National Butterfly Center have filed a temporary restraining order to prevent the federal government from beginning construction on its land. The development comes a week after heavy equipment and materials for border wall construction arrived near the center. Marianna Treviño, executive director for the center, said last Monday during a wall protest that attorneys would be filing something to temporarily halt what’s feared to be the destruction of the land’s vegetation. The 20-page court filing requests the court to order an injunction against the government in its efforts to construct a wall on its property. If granted, the injunction would hold until the court rules on a lawsuit filed by the National Butterfly Center against the U.S. Department of Homeland Security and others now more than 14 months ago. “Comes now Plaintiff the North American Butterfly Association (“NABA”) and seeks a temporary restraining order and preliminary injunction to stop Defendants and their employees, agents, and contractors from taking any further action on the National Butterfly Center in furtherance of the construction of a border wall, enforcement zone, road, or any related installations, or otherwise interfering with NABA’s use and enjoyment of its property, until the Court rules,” the temporary restraining order brief states. Congress allocated about $1.6 billion in funding for border wall construction in March 2018 for a handful of locations in a $1.3 trillion omnibus spending bill — 25 miles in Hidalgo County and about 8 miles in Starr County. The TRO filing comes as heavy equipment prepares to begin the destruction of vegetation on about a 6-mile stretch on the center’s land, signaling the beginning of border wall construction in the county. The property, which borders the Rio Grande and is part of the U.S. Fish and Wildlife Service’s Lower Rio Grande Valley Wildlife Corridor, is expected to be the first location for construction in Hidalgo County. Wright said she saw a grader with a DHS logo near the butterfly center last Thursday; another sign that construction was imminent. Employees on the land have also complained about U.S. Border Patrol replacing the center’s gate lock south of the levee with its own, temporarily limiting their access to portions of the land. Wright testified on Jan. 16 before the Committee on Natural Resources in Washington, where she underscored the damage construction would have on the land, and the many species that call the area home. The filing also comes as lawmakers appear to have agreed on a border security deal that would not only fund the government through the fall, but also gives the Trump administration about $1.4 billion for border wall fencing, with tentative details pointing to about 55 miles in the Rio Grande Valley. Where the fencing would specifically be erected has yet to be announced. Wright, who was in El Paso on Monday for the president’s visit, said Tuesday morning that she now expects attorneys to be in front of a judge within 21 days of the filing, which she said would be the first real movement in the lawsuit since it was filed in December 2017.